Property 14: Superb chalet, stunning views, close to lifts and all services. Property 26: Traditional Cosy Swiss Chalet with incredible views. Property 38: A Lovely Spot in One of Europe's Best and Largest Ski Regions. Cosy Ski Chalet Ideal for Families Or Group of Friends. Lovely in Summer Too! 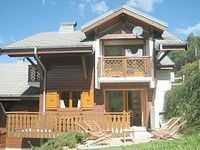 Property 41: Cosy Ski Chalet Ideal for Families Or Group of Friends. Lovely in Summer Too! Property 48: Beautiful 4 bedroom family chalet in a fantastic setting. Comfortably sleeps 8. Excellent location just a short walk (10 mins easy) from Chatel village and the restaurants. Set onto the side of valley it gives amazing views. Dedicated car parking outside chalet. Modern facilties yet traditional charm and feel. Extremely well equipped kitchen which we used all but 3 nights. 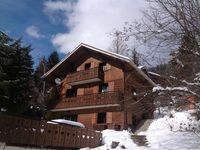 Nice size bedrooms with views and plenty of living space with all you need for a very happy break in Chatel. Very comfortable, warm and cosy. Cleaners team very good and chalet was spotless on arrival. Would certainly visit again and recommend. We stayed for a week in Chalet Mytrilles as a group of 10 adults. The chalet was very warm and comfortable with plenty of space for everyone to chill and hang out. The kitchen is well equiped and we were able to cook dinner for 10 each night. The bedrooms have plenty of storage and there is a boiler room to leave boots overnight so they are nice and warm for the morning. The hot tub on the balcony was a definite highlight and was regularly cleaned. The owner was very easy to keep in touch with and quick to respond to any queries. The chalet is located within 100m of the nearest ski lift, or you can get the free shuttle into Chatel which runs every 20mins or so in the morning and afternoon. The view from the rooms and the balcony is beautiful! We will definitely be back.